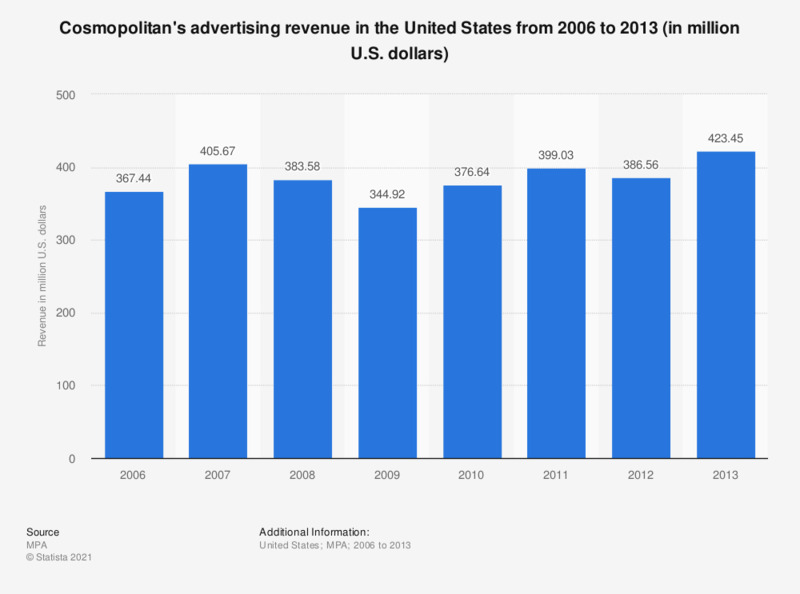 The statistic above shows Cosmopolitan's advertising revenue in the United States from 2006 to 2013. In 2012, the women's magazine generated a total advertising revenue of almost 386.6 million U.S. dollars. Here you can find out how many advertising pages the magazine sells annually. Cosmopolitan was first published in the United States in 1886, dedicated as a family magazine, then a literary magazine. It was not until the late 1960s, that Cosmopolitan became the women’s magazine that is today. As of 2014, Cosmopolitan was available in 64 different international editions, in 35 languages, and in over 110 countries. In the first half of 2014, Cosmopolitan remained one the leading consumer magazines in the United States and was ranked third with 774,077 single copy sales. As a result of its popularity with consumers, the advertising revenue at Cosmopolitan has remained important but not always stable. In 2007 for example, the number of advertising pages was calculated at 1815.98. By 2013 however this figure had dropped to 1466.96 pages. In the future, expenditure on advertisements in print magazines is expected to decline as priorities are expected to shift and precedence given to spending on digital magazine ads instead. Reflecting a declining magazine industry, the number of Cosmopolitan readers in the United Kingdom has dropped from 2.03 million readers in the second half of 2003 to 1.29 million readers in the second half of 2013. Those surveyed in the UK claimed that cost (70 percent) and a lack of time (42 percent) were the reasons for reading fewer magazines. Declines in the market have been attributed to consumers being less likely to be tempted by impulse buys, especially after the recession. The price of magazines may seem too high for many consumers, as is reflected in the UK consumer survey. Women’s magazines have seen some of the largest declines in the magazine industry as a whole. Figures for the period 2006 to 2011 come from earlier MPA reports.